To run a comparison in Gearset, you need to add a source and target location of your metadata. Gearset supports comparing and deploying metadata that is source controlled, with support for any git-based source control provider. 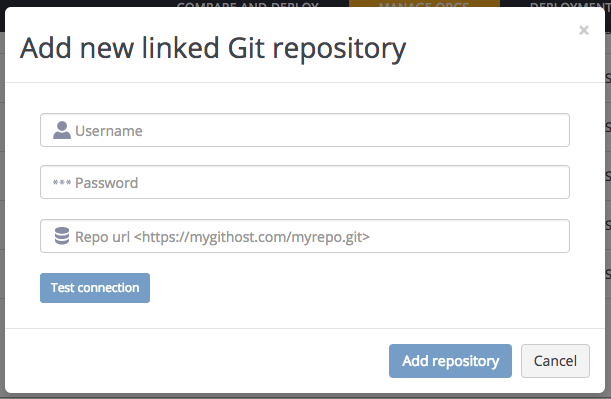 If you use one of the popular hosted services such as GitHub or BitBucket then you can connect to those using OAuth. If you need to connect to a git server that you're running on-premise then you can still do that using Gearset's support for manual connections. Your connection will now be listed on the connections page. If your account uses 2FA, you may need to create a custom application password for Gearset to connect to your repository.